YUMA, Ariz., April 3, 2013 - Acoustifence soundproofing material placed around a pickleball court reduced noise by 10-12 decibels in a sound meter test conducted by USA Pickleball Association president Bill Booth on April 17, 2012 at the Country Roads RV Village pickleball courts in Yuma, Ariz. This represents more than a 50 percent reduction in sound as perceived by the human ear the report concludes. Even as one of the fastest-growing sports in the United States continues to gain new participants and fans every day, pickleball is disturbing some neighbors and communities who don’t want the courts around because paddle noise has become a nuisance issue for some people living close to the courts. In addition to being one of the fastest-growing sports in the United States today, pickleball has spread overseas into Canada, Singapore, India, Pakistan and other places. According to the USA Pickleball Association, the sport boasts an estimated 100,000 adult players in the United States now, more than triple the number in 2003. There are about 2,500 public courts, versus just 150 in 2003. For decades, the game of pickleball was little known outside the Pacific Northwest United States. Since its inception in 1965 as a backyard pastime, it is now an organized sport represented by national and international governing bodies. While people ages 6 to 70-plus play pickleball and even compete in local, regional and national tournaments, the main driver of the recent growth is the 55-plus demographic who have taken a liking to the sport. They view it as a way to exercise, burn calories, socialize, and get outdoors. More and more pickleball courts are being built in community parks and especially into 55-plus housing developments. Some communities are converting sporadically used tennis courts into pickleball courts or painting additional lines on tennis courts so pickleball can also be played. Pickleball is played on a smaller court size than tennis but has a similar court design. More courts, participants, tournaments, and attention to the game has brought on more public complaints and even noise or nuisance related lawsuits attempting to stop play on existing courts or stop construction of new courts. Racquet and paddle sports like tennis, badminton, and table tennis (ping pong) each produce a unique sound when the racquet or paddle hits the ball. In pickleball, there is a “ping, ping” sound made when the paddle hits the ball because the sport uses medium-sized, solid faced wooden, composite or graphite paddles and a hard plastic perforated ball (resembles a Wiffle ball) that is larger, stiffer and less resistant than a tennis ball. The noise generated by the game is louder, sharper and at a higher pitch than tennis which generates a deeper “thwack” sound that registers far lower on a sound meter. Pickleball paddle noise is in a sound classification called impact noise – noise that occurs when an object collides with another object. It is a high frequency noise that is at a frequency that our ears are most attuned to. Through Acoustiblok’s analysis and modeling efforts of various pickleball noise related projects, the company says there’s one limiting band of approximately 1.25 Khz (1250 hz) that spikes when the paddle hits the ball. Acoustifence blocks much of the noise and reduces it to below a nuisance level for nearby neighbors, becoming barely perceptible among other outdoor background noises such as automobile, airplane, human, and machine noise. Unlike often tried natural sound barriers such as fences or shrubs, the Acoustifence material does extraordinarily well in not only blocking direct sound, but also has a tendency to reduce sound from reflecting off it. Acoustifence is a revolutionary heavy mineral filled viscoelastic polymer sound deadening material which is only 3mm (1/8 inch) thick. It’s made in the United States and compared to other soundproofing alternatives, is an economical way to reduce outdoor noise. Country Roads RV Resort is a 55-plus gated community which boasts 150 acres of lavish, mature landscaping and 1294 privately owned home sites. 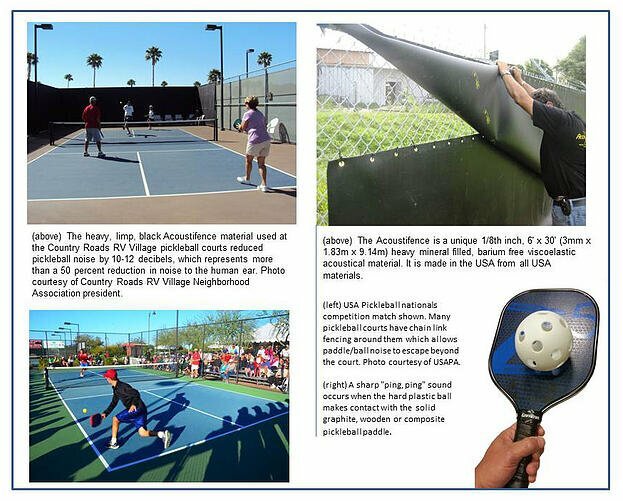 The Acoustifence testing was conducted by USA Pickleball Association president Bill Booth. Tests were made using a Sper Scientific Digital Datalogging Sound Meter (model 840013), a S-Type Composite Extreme Paddle, and New Dura Fast 40 outdoor balls. Tests were made with the tester attempting to hit the ball with maximum force for a worse-case scenario. A series of readings were taken both through the Acoustifence sound curtain and with no sound curtain. Readings were recorded with the meter at 50 feet from the point of impact. In the first case, the reading was even taken through the sound curtain next to a nearby home at a point 42 feet from the sound curtain. The paddle was 8 feet inside the court for a total of 50 feet. The second set of readings was recorded inside the court at a distance of 50 feet from the point of impact. With no sound curtain, readings ranged from 64.2 – 71.8 decibels for an average of 68 decibels. Through the Acoustifence sound curtain, the meter readings were between 54.7 – 59.2 decibels for an average reading of 56.7 decibels. The report concluded that an 11.3 decibel reduction in sound was achieved. This represents more than a 50 percent reduction in sound as perceived by the human ear by nearby homeowners. That reduction in sound takes the pickleball noise from being annoying to someone to being just barely perceptible, the report conclusion stated. The report also recommended that the Acoustifence product be installed on the inside of the pickleball court if the fence posts are outside the court. The report went on to say that homeowners near the Country Roads RV Village pickleball courts who had the most complaints and lived closest to the courts reported a significant reduction in sound level from having the Acoustifence material up. He said that his wife often does not realize that they are playing on the court. At times, ambient noise significantly exceeded paddle noise. Lahnie Johnson is president and founder of Acoustiblok, Inc., a NASA spinoff listed company in Tampa, Fla., that invented and manufactures the Acoustifence product. “Acoustifence serves as a barrier and blocks high frequency sounds very well. The material actually flexes with certain frequencies. In the process of sound waves physically moving it, the product transforms sound wave energy into inaudible internal friction energy. It’s Underwriters Laboratories listed and has attained an STC (Sound Transmission Class) of 28 decibels in independent laboratory tests,” said Johnson. “Like all our products, Acoustifence is made in the USA with all USA materials. Besides the primary benefit of reduction in perceived noise levels, there are many reasons why Acoustifence is being used not only in the United States, but across the globe for many applications,” he said. Paul Getts, is an Acoustiblok sales associate who has worked with various pickleball related customers. “There are many reasons why Acoustifence is a good solution for pickleball noise. For homeowner associations and developers, Acoustifence easily attaches to existing fencing found around most existing pickleball courts and complexes and can be put up in a matter of hours with a few minor hand tools. It is easily configurable to add height and length so it can be used on fences of any size. The material is paintable to meet the needs of the environment,” said Getts. “There are vinyl photographic coverings for the fence called Acoustiblok landscapes. Hundreds of different unbelievably realistic landscapes are available, from vines and flowers to even antique brick wall, or stone fence photographs. So real one of our customers drove right by their home forgetting they had it installed,” he added. “Acoustifence is also one of the best priced first response soundproofing solutions in the industry,” Getts added. Melissa Wood is community association manager at Country Roads RV Village. In a related World Fence News article about pickleball and Acoustifence, she said, “I can attest that Acoustifence material is not difficult to install, can be easily blended into the aesthetics, particularly if you have existing wind screens.” She added that Country Roads RV Village is located near Phoenix and other communities have seen the installation and have inquired about it. Besides pickleball, Acoustifence is commonly used to quiet generator and motor noise at industrial sites, highway and construction related noise on bridges, mass transit rail line noise, shooting/gun range noise, and even dog kennel noise. It is also being used at college sports complexes and athletic parks and on private backyard residential fences to create a quieter and more peaceful environment. “People are discovering that there are a lot of great uses for this modern day soundproofing product,” Johnson said. Johnson went on to say, “We’re not just a soundproofing products company, we’re a noise solutions company. Sometimes, prior to the sale of Acoustiblok’s products, we perform computer-based sound propagation modeling when customers are unsure if Acoustiblok’s materials will work in their specific application. For more information about Acoustiblok Inc., or Acoustifence visit the Acoustiblok website (www.acoustiblok.com), send an Email to sales(at)acoustiblok(dot)com, or call 813-965-4373. Acoustiblok, Inc, a NASA Spinoff listed company headquartered in Tampa, Fla., provides acoustical soundproofing solutions for noise related issues. The company develops, manufactures, and markets lab tested and certified acoustical products around the world, earning the industry’s highest ratings from architects, builders, and consumers. Primary products include Acoustiblok® viscoelastic polymer based soundproofing material, Acoustifence® outdoor noise barrier, All Weather Sound Panels®, QuietFiber® insulating material, Quiet-Cloud® industrial sound absorption panels, Acoustiblok WALLCOVER®, and Thermablok® nanotechnology insulation. The company also sells a line of acoustical soundproofing accessory products. Acoustiblok products are used every day primarily in industrial, residential, commercial, building and construction/architectural, and marine sectors worldwide. The company’s products are made and sourced in the United States. Acoustiblok, Inc. ships products to approximately 60 countries around the world and has a network of stocking distributors both in the United States and internationally. The company operates a wholly owned subsidiary, Acoustiblok Mideast, in Saudi Arabia to augment our distributor network. About Country Roads RV Village, Yuma, Ariz.
Country Roads RV Resort is a 55-plus gated community which boasts 150 acres of lavish, mature landscaping and 1294 privately owned home sites. 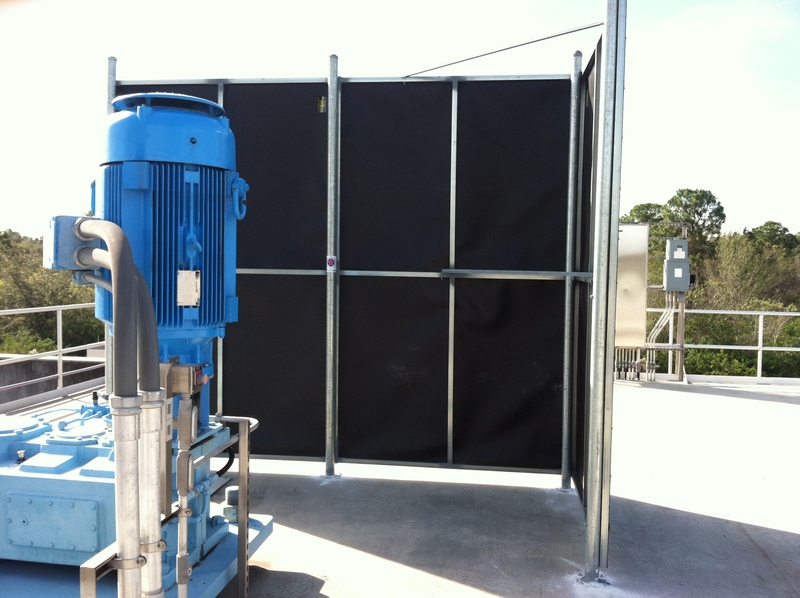 TAMPA, FL, January 16, 2013 – An Acoustifence barrier recently installed near a noisy exposed aerator motor at the Hillsborough County Northwest Regional Facility resulted in an immediate and significant reduction in noise pollution for neighboring residents. The facility is part of a 1,500-acre multi-use tract owned by Hillsborough County. It is a Type 1 advanced wastewater treatment facility built to process five million gallons of wastewater per day. The facility is located on a 67-acre parcel of land 10890 South Mobley Road in Hillsborough County Florida. A residential community called Highland Park is located near the county facility. Last year, members of the Highland Park Residential Community voiced their complaints about loud whining noises coming into their community from the nearby county facility. The facility took action to find a solution to the noise issue. In residential areas, road traffic noise is usually the major source of noise, with air conditioning/heat pumps, generators, construction, and industrial noises also problems typically. Wastewater is sewage, storm water and water that are used for various purposes around the community. Unless properly treated, wastewater can harm public health and the environment. It is not uncommon across the United States for wastewater treatment facilities like Northwest to be located within hearing range of residents living in a particular area. 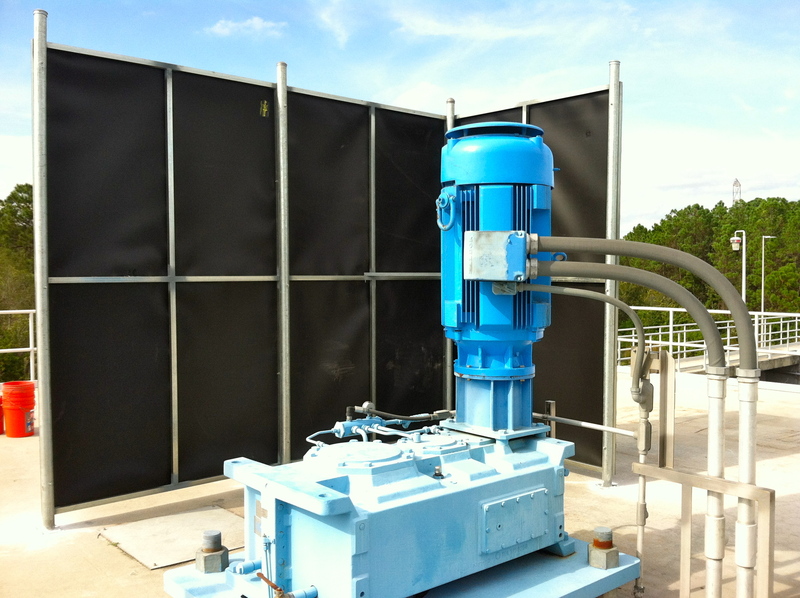 The wastewater treatment facility noise source was a 200-HP Carrousel vertical, high efficiency aerator drive motor located on top of the facility’s 24-foot Oxidation Aeration Basin structure according to Flint Seth, general manager of bio solids production and maintenance at the Hillsborough County Northwest Water Reclamation Facility. Doug Fisher of the Hillsborough County Public Utilities Department worked with Acoustiblok to devise an economical solution consisting of an L-shaped frame barrier with four 6 X 30 foot-Acoustifence outdoor noise reduction panels secured to it. Acoustifence is a product of Acoustiblok Corporation. Witt Fence Company of Riverview, Fla., was contacted by Hillsborough County personnel to install the barrier. From a technical standpoint, Acoustifence is an advanced sound barrier. A sound barrier, by its own named definition, is put between the noise source and the listener. Some barriers can be made of virtually anything that sound does not penetrate. There are however, differences and distinct advantages in some over others. Unlike a concrete block wall, which in one respect is a good sound barrier, the Acoustifence actually flexes with certain frequencies, especially very low frequencies. In the process of sound waves physically moving it, the product transforms sound wave energy into inaudible internal friction energy. A concrete block wall would not do this. As the Acoustifence is only 1/8 of an inch thick, it is very easy to position it closer to the noise source. The closer a barrier is to the noise source the more restricting it becomes to the initial sound waves. Acoustiblok Corporation’s Acoustifence product is a unique proprietary formula. It is a heavy mineral filled viscoelastic polymer material that is 1/8 inch thick and made in the United States. It comes in 6 X 30 foot-sheets. It is one of the most effective first steps in reducing noise for many applications including industrial, commercial, and residential. The amount of noise it reduces however is much related to other reflective structures in the area. Sound pressure is measured in decibels. The average person can hear sounds starting at 0 to 1 decibel. A typical conversation occurs at 60 decibels – not loud enough to cause damage. An idling bulldozer (not bulldozing) is loud enough at 85 decibels that it can cause permanent damage after only 1 work day (8 hours). If a sound reaches 85 decibels or stronger, it can cause permanent damage to a person’s hearing with prolonged exposure. The amount of time a person listens to a sound affects how much damage it will cause. A noise meter was used to measure the difference in sound before and after the installation of the noise barrier fence at the wastewater facility. Typical noise from these Carrousel vertical aerator motors ranges from 80-83 decibels from three feet away according to the manufacturer. From 10 feet away, the noise measured 79 decibels before installation of the Acoustifence began and registered 69 decibels immediately after the fence was in place. In a 10 decibel decrease in sound level, perceived loudness is cut in half to the human ear. "While we were pleased with the reduction in sound decibels picked up by the meter, the most significant difference that we noticed was the reduction in noise heard by the ear. The reduction in noise felt significantly higher than what registered on the sound meter," said Seth. According to OSHA, typical engine noise, mainly caused by mechanical and combustion forces, can typically range from 100 - 121 decibels measured at approximately 10 feet. Besides the proven and tested sound reduction qualities of Acoustifence, another beneficial quality of the product is that it is quick and easy to install. "Once we determine the technical solution to a noise issue, the installation of our products is not time consuming or labor intensive," said Lahnie Johnson, President and Founder of Acoustiblok. Installation of the sound barrier at the Hillsborough County facility was fast and they encountered no unexpected problems. "It took only one day to install the barrier and it resulted in an immediate decrease in directional noise for our facility," Seth said. "Acoustiblok’s success is not just about the products we have invented but more about the innovation of the products in finding solutions for people’s noise problems. For advanced problems, we incorporate state-of-the-art acoustical prediction software modeling. This allows us to really tie down what the results will be in advance of someone’s purchase and of course can result in huge financial savings to the customer," Johnson added. While the solution to the noise issue at the wastewater treatment facility was not a complex one, it was an effective one for Hillsborough County. "The Acoustifence barrier made a difference and we are very pleased with it. We have not received any new complaints about the motor noise since the installation of the barrier fence so that’s a good sign so far. We are currently planning to build additional barrier fences for some of the other vertical aerator motors we have on site," Seth added. While Hillsborough County is happy with how the small amount of Acoustifence quieted the large pump, Johnson sees this as the first of literally thousands of similar pumps around the country and overseas hat may need a similar noise abatement solution. About Acoustiblok – "Quieting the World"
Acoustiblok Corporation, a NASA "Spin-off" company headquartered in Tampa, FL, provides acoustical soundproofing solutions for noise related issues. The company develops, manufactures, and markets lab tested and certified acoustical products around the world, earning the industry’s highest ratings from architects, builders, and consumers. Acoustiblok Corporation ships products to approximately 60 countries around the world and has a network of stocking distributors both in the United States and internationally. The company operates a wholly owned subsidiary, Acoustiblok Mideast, in Saudi Arabia to augment our distributor network. For more information about our Acoustifence or other Acoustiblok products, or to speak to a knowledgeable Acoustiblok sales representative, call 813-965-4373. Learn more about Acoustiblok products on the Sound Solutions Products page of our website or click here to send an Email inquiry. Acoustiblok sound abatement material was used to seal noise leaks in the massive doors of the historic film studio, in time to begin shooting "City of Ember," starring Natalie Portman and Bill Murray. The pressure was on to find a solution to the ambient noise from nearby construction, heavy traffic from a main road, and overhead aircraft infiltrating the massive 31,000 m³ (1,094,755 cubic ft.) structure. Before it was a film studio, Paint Hall was part of Belfast’s historic Harland & Wolff Shipyards, where the Titanic and other ships were built. Ship Hall was used for painting huge portions of ships in climate-controlled conditions. While the studio’s double skinned cell construction combats general noise pollution on set, the building’s massive 75ft (23m) doors were found to be leaking sound. filmmaking, which easily pick up background sound. Consultants from Acoustiblok UK Ltd conducted a site visit and compiled a comprehensive report identifying the building’s acoustical weaknesses and vulnerabilities, then devised a workable solution to meet the producers’ schedule. also been installed at both Pinewood and Leavesden studios in the UK, was installed by the filmmakers under the close supervision of the Acoustiblok team. Vast cavities within each door were first filled with an open cell fibre. 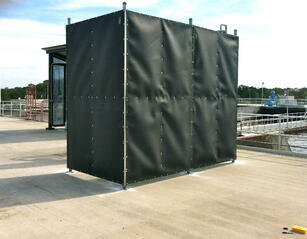 Acoustiblok membrane was then attached to steel supports within the doors and secured with resilient channels. The steel structure was also treated with Thermablok® aerogel insulation material to increase acoustical dampening, and to address transmission loss properties. New corrugated facing panels were installed as an external finish. Brian Martin, a technician with Muldiss Darton Productions of the UK, said that producers were hard pressed to find a workable solution to the noise problemnoise problem that could be in place before scheduled filming began. recording, as the microphones used are highly sensitive and can pick up every single sound in the background. Acoustiblok is made of a 1/8” (3 mm) thick proprietary viscoelastic polymer material with a high-density mineral content, heavy yet extremely flexible. While other manufacturers of sound proofing materials attempt to stop or absorb sound, Acoustiblok has resolved the problem in a vastly different way. Through a unique thermodynamic process, Acoustiblok is engineered to transform sound energy into inaudible friction energy as the material flexes from sound waves. One thin layer of Acoustiblok in a standard metal or wood stud wall will result in more sound reduction, and provide more privacy, than 12” (30.5 cm) of poured concrete. Acoustiblok backs its claims with hard science and certified independent laboratory test results. The acoustical laboratory at Architectural Testing, Inc. in York, Pennsylvania, recorded an astounding Sound Transmission Class (STC) of 85 for a concrete block and metal stud wall design configuration that included Acoustiblok, a noise reduction of 99-percent to human hearing. Ultimately, the installation of Acoustiblok to the Paint Hall studios has made it an extremely desirable venue for attracting future big budget films. Paint Hall is not the first major film studio to install Acoustiblok for perfect sound quality. The UK’s Pinewood and Leavesden studios are also treated with Acoustiblok, setting the stage for some major blockbusters including the Harry Potter, Star Wars, and James Bond movies. For more information, visit our website at www.acoustiblok.com, e-mail us at sales@acoustiblok.com, or call us at 813-980.1400. © 2014 Acoustiblok, Inc. All rights reserved.